For a while now I've considered branching out in what I review. I'd like to review other things - clothes, jewellery, phone covers - and post them alongside nail art that has been inspired by it. This will always be a nail art blog, but I think it's really cool to see the inspiration next to the nails - and not just an image, but something solid and real. It also means that I can get the occasional pretty thing while helping out a company I like. As reviewing things take time and effort, I will be limiting reviews to only the things I think are quality and worth promoting (both the company and the product); I think that makes for a good and honest blog. As usual, you can find my contact details under the "contact me" tab. 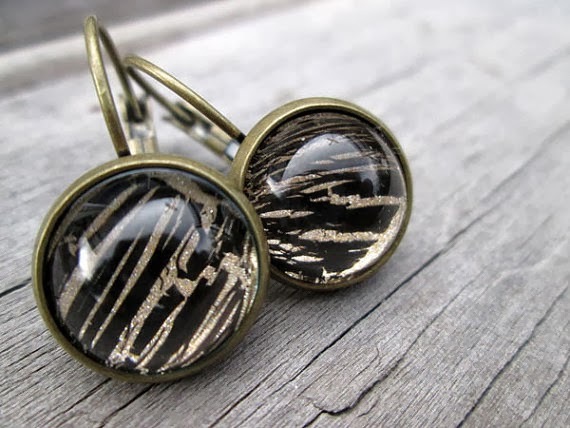 When PK from Glam-Madam approached me I was very keen to review an item from her Etsy Store! 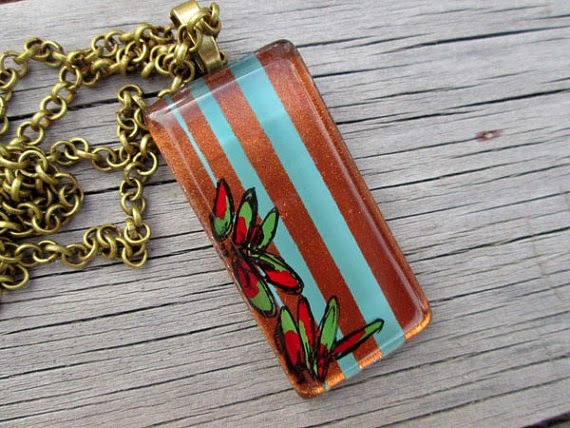 PK is a fellow New Zealander and sells a variety of jewellery - all hand-painted to a high standard. Here's the "Daisy Mae Glass Necklace" I got, next to the nails that were inspired by it. The necklace also came with a lovely note giving details about the necklace and how it was made - here are some excerpts. Hand-drawn daisies and a bumblebee. The perfect garden! The wee bumblebee charm can be worn either in the back next to the clasp - would look fab if you wear your hair up - or as a pendant next to the daisies. The clasp is sterling silver. The chain silver plate, nickel free. 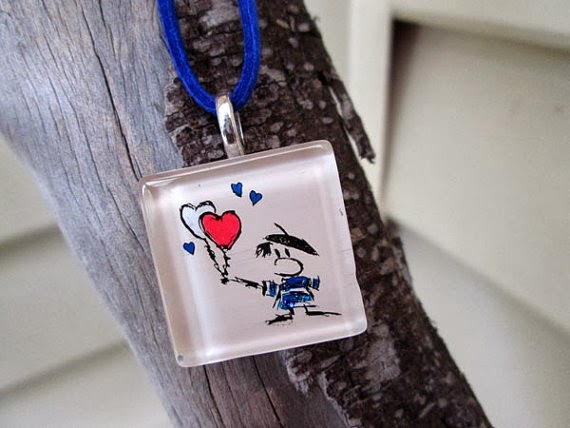 Pendant size is 7/8" rounded square (2.2cm). There are two jump rings on the chain to move the pendant around. This is done easily with small pliers. This pendant has no setting (i.e tray), allowing the colours to flow and light to create the inner beauty. Each piece of jewellery has "a drop of red" on the back. That is my signature, me. I use the best quality fused and polished glass I can find and source it from the states, where it is hand made in their kiln. I love it. I have to say, it is probably the most high-quality thing I've ever reviewed. You know those cheap necklaces you can buy from the mall for a few dollars? The light ones, made out of something that feels like it wouldn't survive a toddler pulling on it. I remember I was wearing one of those when I was at a fair once - I was on some ride and the pendant just fell off! Went flying away and I never found it. Other ones get gross and discoloured after a while. This isn't like that; this necklace is quality and I've been wearing it a lot! 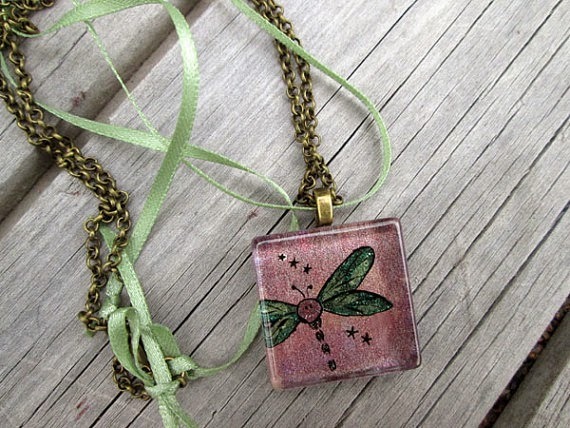 I love the way it feels around my neck - secure and weighted, but not too heavy. Anyway, so on to the nails. When I was browsing through Glam Madam's Etsy listings I thought this would be perfect - it's a good design to recreate on my nails. I planned initially to do the exact same design... until I realised I haven't got a nail polish even remotely like the one in the background here. So I adapted, and I ended up quite liking the new design! Gradient/ombre sunset with the daisy silhouettes in the foreground - there's just something about floral manicures, isn't there? The chains are silver plate or bronze, also nickel free; and the ear wire is silver plated surgical steel and hypo-allergenic. 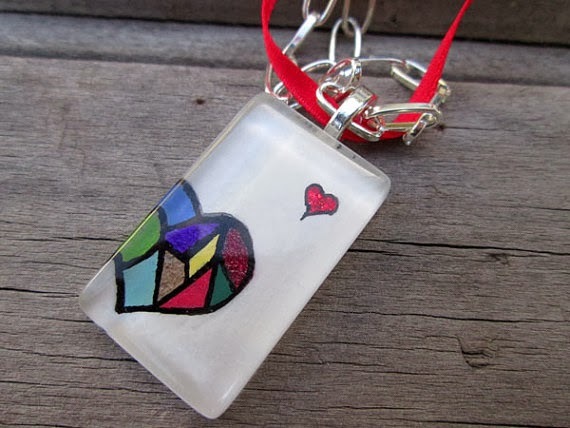 All of my jewellery is hand-drawn/painted by me based on my own designs, ideas and thoughts. Everything has a story and was envisioned with a purpose. It should speak to you and give you the feeling of being understood. I hope you like this post; for both the nail art and the necklace! Here's a list of a few key links to PK aka Glam-Madam's store. I should mention, too, that she can custom-make things! So if you want to surprise someone with a necklace matched to their favourite dress... ;). 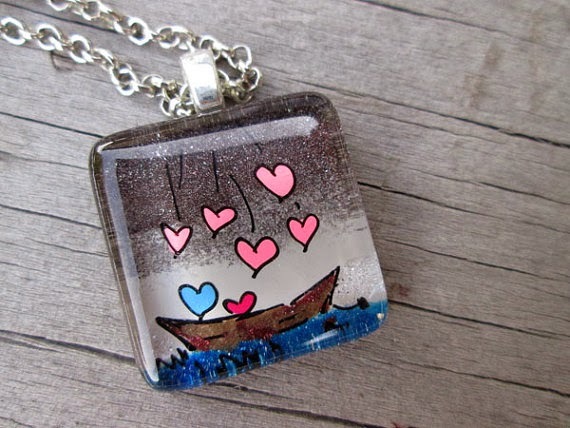 You can buy this necklace here. You can visit Glam-Madam's shop here. While writing this blog post I fell in love with some of her more recent listings - aren't they cool? You can click on them to go to the relevant listing ☺.